AdEdge Water Technologies, LLC recently delivered a water treatment system to San Antonio de Los Cobres, a village of 6,000 residents in the Andes Mountains, to reduce a challenging arsenic concentration of 290 ppb to below the MCL set by the World Health Organization of 10 ppb. His Heart Missions, a non-profit organization dedicated to international community service projects met with AdEdge in 2006 to begin planning and fundraising for the project. The village had a history of higher than normal incidences of cancer, heart failure and other health issues. 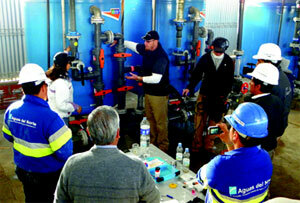 A team from AdEdge traveled to San Antonio de los Cobres in November, 2011 to start up the system and train the local system operators. The AdEdge treatment system design features a two stage system. The first stage uses AdEdge GS+ coagulation filtration media with an iron augmentation module, and the second uses AdEdge granular ferric oxide (GFO) adsorption media. An existing sodium hypochlorite chemical feed module was integrated with the AdEdge system. Both treatment systems are modular and manually operated to accommodate the design flow of 200 gpm. The water system is served by a springhead from which the raw water passes through a series of existing sand filters that reduce the arsenic level from 290 to 222 ppb, and the pre-treated water flows into a catch basin. From the catch basin, an underground pipe brings the pre-treated water to the AdEdge treatment systems before being distributed to the end users in the community. Startup of the AdEdge treatment system is began in November of 2011. Since startup, water quality test results from Aguas del Norte and the treatment system report the system is operating successfully, and reducing the arsenic concentration levels to less than 5 ppb. Helping Hands For Water, a 501(c)(3) non-profit organization started by a group of AdEdge employees, coordinated the logistics and communication between AdEdge, His Heart Missions, Aguas del Norte and the San Antonio de los Cobres municipality. AdEdge Water Technologies, LLC specializes in the design, development, manufacturing and supply of innovative water treatment systems that remove contaminants from process or aqueous streams. AdEdge offers a full range of conventional and innovative treatment technologies including adsorption, metals precipitation, coagulation, filtration, clarification, ion exchange, advanced oxidation, and membrane based solutions. For more information, visit www.adedgetechnologies.com.